Working on a submarine is very different from commanding a submarine. Both are important jobs, and both involve working closely in sweaty, claustrophobic quarters with people who can frequently aggravate you. That said, being the commander carries a whole other level of responsibility. It’s kind of like the difference between being on a board of directors and chairing a board of directors. If you know who your next board chair will be, here are a few things you can do to help prepare him or her for their transition into the commander’s seat. 1. Include your next board chair in informal conversations between the current board chair and the organization’s chief executive. The relationship between the board chair and the organization’s chief executive is important to the organization’s success. A good relationship between the chair and chief executive depends, in large part, on clear communication, and effective communication between the chair and chief executive often develops through informal conversations that occur between board meetings. Including the next board chair in those informal discussions ensures the chief executive and new board chair already understand each other’s communication styles before a leadership transition happens. 2. Document both informal and formal responsibilities of the chair. Developing job descriptions for board members is at the core of succession planning. However, by the time someone chairs a board, they often have a vast reserve of institutional knowledge that plays an important role in being a successful board leader. In fact, that institutional knowledge likely played an important role in becoming the board chair. A job description isn’t meant to capture institutional knowledge. Make the chair’s job description part of an overall chair “playbook” that gets passed along to each new board chair. Before he or she steps down, have your existing board chair update the document with tips and knowledge the board chair will need to know how to be effective in the new role. 3. Use technology to make your board chair look good. One of the most frustrating aspects of serving on a board of directors is the chaos associated with the average board meeting. Agendas that arrive at the last minute, incomplete or inaccurate minutes, and other seemingly minor inconveniences can add up to a demoralized and disengaged board, and can give a board chair a reputation as an ineffective leader. On the other hand, a board that runs efficiently and effectively increases board engagement and helps bolster your chair’s reputation as an effective leader among his or her colleagues. In other words, a well-run meeting makes your board chair look good, and from a staff perspective it’s always a good thing to help your chair look good. Luckily, BoardPaq is here to do just that. 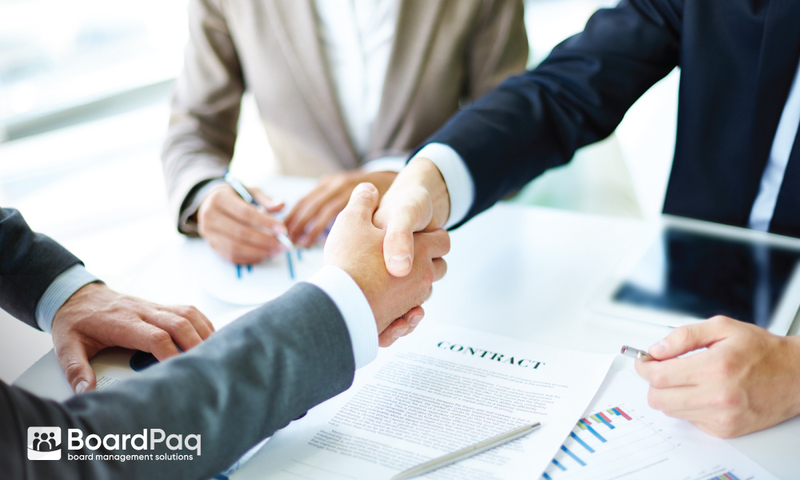 As the board portal choice for more than 1,000 boards, BoardPaq includes a wide variety of features that make conducting board business easier and more efficient. You want to do everything you can to help your next board chair succeed. And you can start today, when you register for a BoardPaq demo.